and build your own decks with the Deck Builder. 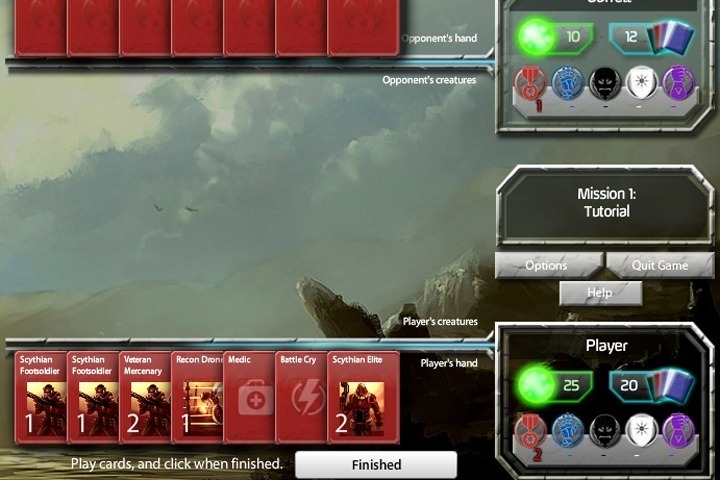 Mytheria is a turn-based card game. if you haven't played a card game like this before, it might be a bit confusing, so we'll show you the basics first! You are at the bottom of the screen, and your opponent is at the top. The goal is to get their Life down to zero, using cards to attack. If you run out of Life or Cards, you lose! At the top of the card is the name, and the type. This card is a Creature, which means it can attack. This large number on the right of the card is the card's Strength, which represents both how much "life" it has, as well as how much damage it can do. This card is a 2, which means it will hit for 2 damage points when attacking, and can also absorb 2 points of damage. the beginning of each turn. The first thing you will do is increase your power. You can do this at the beginning of your turn. For this mission, our cards are all Red, so we only need to increase Red power. If you want to play Mytheria games online you have come to the right place! GamesLoon adds new Mytheria games every week. This is your game portal where you can find the biggest collection of free Mytheria games online. Do not forget to rate our Mytheria free online games while playing!